Prime Minister Nguyen Xuan Phuc has highlighted the effective cooperation between Vietnam and China and particularly Hong Kong across a variety of fields such as economics, trade, investment, tourism and culture. Prime Minister Nguyen Xuan Phuc has described head coach of the Vietnamese men’s football team Park Hang-seo as an important bridge for the promotion of friendship between Vietnam and the Republic of Korea (RoK). Prime Minister Nguyen Xuan Phuc has applauded a host of initiatives to step up ASEAN+3 cooperation, such as building a mechanism warning regional macroeconomic risks to improve the economies’ response readiness, and boosting regional collaboration in early disaster warning. Prime Minister Nguyen Xuan Phuc and his wife will lead a high-ranking Vietnamese delegation to attend the 33rd Summit of the Association of Southeast Asian Nations (ASEAN) and related meetings in Singapore over November 13-15. Prime Minister Nguyen Xuan Phuc on September 23 said the Party, State, people and workers of Vietnam always treasure, be grateful to and highly value the great support and important contributions rendered by the World Federation of Trade Unions (WFTU) to Vietnam during the wars of resistance for national independence and the national construction and defence. 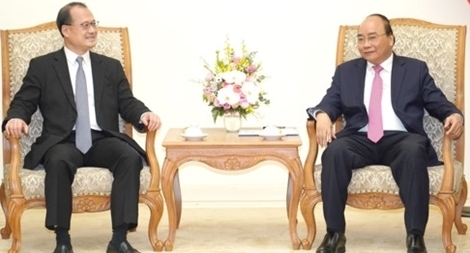 The Vietnam visit by Algerian Foreign Minister Abdelkader Messahel from July 13-14 was given intensive coverage by Algeria’s daily Elmoudjahid. PSNews - The Ministry of Public Security on March 25 held a conference to review its task performance in Q1 of 2019 and appraise results of the implementation of Decree No. 01 of the Government on functions, tasks, authority and organizational structure of the Ministry of Public Security. Prime Minister Nguyen Xuan Phuc will lead a high-level delegation of Vietnam to the annual meeting of the World Economic Forum (WEF), set to take place in Davos, Switzerland, from January 22-25. Prime Minister Nguyen Xuan Phuc has highlighted the European Union as Vietnam’s highly important partner while noting that bilateral relations are growing steadily, as demonstrated by regular exchange of high-level meetings aiming to deepen mutual understanding and trust. Prime Minister Nguyen Xuan Phuc chaired the Government’s regular meeting on December 27, during which he shared that Vietnam’s GDP growth rate rose 7.08 percent in 2018 – the highest ever in the past 11 years. Prime Minister Nguyen Xuan Phuc showed his elation at the strong development of traditional friendship, special solidarity and comprehensive cooperation between Vietnam and Laos while receiving visiting Lao Minister of Justice Xaysy Santivong in Hanoi on December 10. Prime Minister Nguyen Xuan Phuc departed Hanoi on the night of November 16 for Papua New Guinea to attend the 26th APEC Economic Leaders’ Meeting on November 17-18 at the invitation of Papua New Guinea’s Prime Minister Peter O’Neill. ASEAN’s unity must continue to be the key factor in both thought and actions for the sake of a steady, resilient and strongly cohesive ASEAN Community, Vietnamese Prime Minister Nguyen Xuan Phuc said at a plenary session of the 33rd ASEAN Summit in Singapore on November 13. Prime Minister Nguyen Xuan Phuc hosted a reception in Hanoi on November 7 for Chase Carey, President and CEO of Formula One Group, who is on a visit to the capital city to attend a ceremony announcing Vietnam’s hosting of the Formula One race. Prime Minister Nguyen Xuan Phuc left Hanoi for Shanghai on November 4 morning to attend the first International Import Expo of China (CIIE 2018) on November 4-5. Prime Minister Nguyen Xuan Phuc has proposed that the Asia-Europe Meeting (ASEM) should take the pioneer role in promoting multilateral cooperation and international order basing on the law as well as responding to global challenges. -Prime Minister Nguyen Xuan Phuc and his delegation arrived in Brussels, Belgium, on the afternoon of October 16 (local time), where he is scheduled to attend the 12th ASEM Summit, make an official visit to Belgium and pay a working visit to the European Union (EU). Prime Minister Nguyen Xuan Phuc and his wife will lead a high-level Vietnamese delegation to attend the 10th Mekong-Japan Summit Meeting and visit Japan from October 8-10, according to the Vietnam Ministry of Foreign Affairs.